Tawnee Prazak got her first taste of triathlon right after she graduated from San Diego State University in 2007. In her first season, she completed five sprint and Olympic triathlons as well as a few 5K and 10Ks. She had been active all her life. Working 8-to-5 in the high-pressure deadline world of journalism was still pretty new to her. At the end of each day, she needed to workout the way some folks crave a stiff drink or Doritos. Tawnee loved how she felt after running on the trails, putting in 2,000 yards in the pool, biking with her boyfriend, and lifting weights at the gym. In January 2008, she felt a sharp pain on the side of her knee – a classic sign of Iliotibial band syndrome. She received physical therapy to balance the muscles and alleviate the soreness. But it became evident that this was not the underlying problem. “My knee would pop and click every time it rotated on the bike,” she explained. Tawnee did what every responsible triathlete would do – she scheduled another bike re-fit at Trek Bicycle Superstore in La Mesa. Turned out, she was pretty dialed in. She tried new stability running shoes. She was still in denial. She thought ‘No, this can’t be happening. I have all these races to do!’ Tawnee saw an orthopedic surgeon who ordered an MRI right away, thinking it was a routine torn meniscus. Her workouts began to diminish because she couldn’t push past the pain. Without her usual workouts, she felt tired and frustrated, especially waiting for test results, doctor’s appointments and a diagnosis. She needed to think about it. She spoke to her family and friends. And in true journalistic fashion, researched everything available on the Internet on Plica Syndrome. She started off with 1 lb. ankle weights and leg raises, clams, electrical stimulation and ice. Later on, she built up to walking with an exercise band around her quads and doing squats. Her physical therapist regularly massaged the areas of her surgical insertion to discourage the development of scar tissue. She wondered ‘Am I ever going to be able to bend over again without falling down?’ and ‘How is this ever going to loosen up again to bend normally?’ It seemed impossible. “They were simple movements that laid down the foundation for those muscles to move properly again,” she explained. 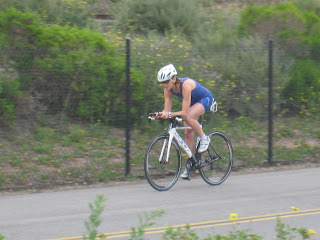 In the Catalina Triathlon, she came in third place in her age group with a time of 1:14:38. She competed with her mom who placed second in her age group. The girls partied afterwards to celebrate their finish. In November, she placed 1st in her age group in the Dana Point Turkey Trot. And in December, she placed 1st in her age group in the XTERRA 15K Crystal Cove Trail Run. She finished the year strong. 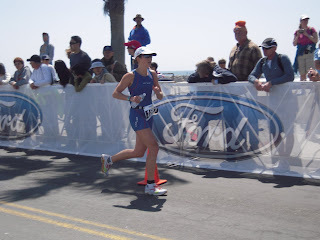 Over the winter, Tawnee trained for her first half-Ironman race in Oceanside. She woke at 4:30 a.m. twice a week for her master’s swim workouts. She put in 15 hours a week of training. All her hard work paid off on April 4th. She made the podium, placing 4th in her age group with a time of 5:40:13. Tawnee’s injury became a turning point in her career. She liked learning more about how the body works from the folks at physical therapy so much that she decided to quit her job and go to graduate school to pursue her new passion with a degree in kinesiology. She’s still exploring her career avenues in between hitting the books and training for her next triathlon. Her final pep talk words, “I think with an injury, you just have to say ‘This will pass. I will get better, and I will be that much stronger when I do.’” Smart kid.